Mark Lawson of Mark Lawson Antiques will talk about antiques, appraisals, and the ins and outs of downsizing at the Malta Community Center on Saturday May 6, 2017. Learn more about the constantly changing trends in the antiques world, and watch a live appraisal of antiques and other items of interest provided by audience members. This promises to be an exciting event; you never know what treasures will come to light at this highly anticipated yearly appraisal show. 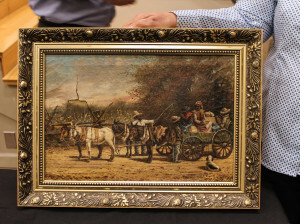 Previous finds at the Malta event include an uncommon original oil painting by William Aiken Walker. Details: Pre-registration is required. Contact the Malta Community Center at (518) 899-4411 for additional details. Your representative made us feel at home - she was very thoughtful, professional, informative and made us feel you and your associates were not only truly good at what you do, but honest and reliable. Thank you for an enjoyable meeting. - Pam T., Spencertown, N.Y.